We welcome the world by providing best in class entertainment and hospitality experiences. Barclays Center management is dedicated to providing an exciting and memorable guest experience while ensuring the safety and security of all guests. The following guide provides information and policies/rules for attending any Barclays Center event. These policies apply to all guests. Guests who violate any of the policies will be escorted by security out of the arena. In addition, Barclays Center management reserves the right to suspend season ticket privileges for guests who do not comply with these event policies. The Access-A-Ride bus stop at Barclays Center is located on Atlantic Avenue, between Flatbush Avenue and Ft. Greene Place. The stop is situated on the south side of Atlantic Avenue, adjacent to the arena, and is nearest to the Calvin Klein VIP Entrance. Please see our Disabled Services A-Z Guide for information regarding accessibility. Barclays Center is proud to be partnered with New York Marriott at the Brooklyn Bridge located only 1.3 miles from the arena. Click here for special rates, check “corporate/promotional code” and then enter W85. Barclays Center is located at 620 Atlantic Avenue Brooklyn, NY 11217. Barclays Center does not institute an age requirement to enter for most shows with the exception of EDM and select other events. If a guest plans to attend and is under the age of 18 years old, we strongly suggest they be accompanied by a parent or guardian. Barclays Center does not provide a parent waiting area, however there are local restaurants and shops in the area that you may visit. Barclays Center is easily accessible from J.F.K. International Airport and LaGuardia Airport. You’ll find directions to the arena on our Getting Here page. Alcohol service can also be discontinued at the discretion of management. Barclays Center and its food and beverage concessionaires have adopted an alcohol policy that is designed to protect guests and the community from alcohol-related incidents. In addition to our responsible alcohol service guidelines below, Barclays Center offers a designated driver program at most major sporting events. Barclays Center reserves the right to deny entry to guests who appear to be impaired. All guest who appear to be younger than the age of thirty (30) will be asked to show positive identification prior to being served alcoholic beverages. Acceptable forms of valid United States identification are: Driver’s License, Passport, United States Passport Card, State Issued I.D. Card w/ Photo, Military I.D. w/ Photo and Mexican Consular Card. Barclays Center reserves the right to eject anyone under the age of 21 who is observed to be in possession of, or consuming alcohol on the premises. Barclays Center and its food and beverage concessionaires will implement ongoing responsible alcohol management T.E.A.M (Techniques for Effective Alcohol Management) training sessions for its serving staff. Animals are not allowed in Barclays Center; however, an exception is made for leashed, harnessed, and housebroken Service Animals. Please be advised Barclays Center reserves the right to exclude Service Animals which act in “out of control” manners. If a patron plans on bringing a service animal into the venue, we encourage them to contact us as early as possible for potential seating relocation purposes. To place requests for in-game announcements during Brooklyn Nets Basketball regarding birthdays, anniversaries, proposals etc. please email [email protected]. Your request will be forwarded to the appropriate persons. Barclays Center is equipped with a "Listen" assisted listening device (ALD) system. Receivers are available for all events and are provided free of charge with a valid form of identification from the Brooklyn Marriott Guest Services Center located on the Ticketmaster Main Concourse. There are a total of seven ATMs in Barclays Center. There are five located on the Ticketmaster Main Concourse of the arena conveniently located at all four corners of the building and one additional in the GEICO Atrium. In addition, there are two located on the Metro PCS The Brooklyn Hospital Center Upper Pavilion. Barclays Center does not have designated autograph locations and does not process autograph requests. Guests seeking autographs may only do so from their ticketed seat location. Baby bags, plastic bottles, and formula are permitted into the building. Should the bag become an obstruction due to its size, guests may be asked to check the bag in to the Ticketmaster Main Concourse Brooklyn Marriott Guest Services Center. Guests who are carrying bags larger than 18”x14”x6” must enter through Barclays Center’s EmblemHealth Dean Street Entrance. Special consideration will be made for guests with medical needs and those caring for infants. All bags are subject to routine search. Barclays Center will implement the following policies to ensure a safe and enjoyable event experience for all guests. Guests who are carrying bags larger than 18”x14”x6” must enter through Barclays Center’s EmblemHealth Dean Street Entrance. Special consideration will be made for guests with medical needs and those caring for infants. This policy does not apply to credentialed media. All bags are subject to routine search.For a full list of prohibited items, please click here. Barclays Center is committed to creating a safe, comfortable, and enjoyable entertainment experience. Please be aware of our Whistle Policy, which requires guests to refrain from accessing their seats until the ball/puck is no longer in play. This policy enables guests to enjoy an unobstructed view of the game. Guests are welcome to bring their personal binoculars for most events at Barclays Center. To make a reservation, guests can visit the Brooklyn Marriott Guest Services Center. Tickets and information for Barclays Center events are available online by clicking on our Events and Ticketing page on our website, barclayscenter.com. To purchase tickets, please visit Ticketmaster at ticketmaster.com or call 1-800-745-3000. Box Office hours of operation will vary weekends and event days. Cameras with telephoto or interchangeable/detachable lenses and external flash (professional photography equipment) are not permitted inside Barclays Center at any time. Video recording devices, audio recording devices, monopods, bipods and tripods are also not permitted. Video recording on any device and/or flash photography is prohibited at all times. This policy will be strictly enforced and management reserves the right to deny any electronic device at their discretion. In the rare event that a Barclays Center event is cancelled or postponed, please visit the specific event page or email [email protected] for more information. Barclays Center offers convenient and easy access to captioning services for select events. When captioning is available, the arena announcements and emergency announcements made on the Public Address System will be captioned. This mobile-based system allows any guest with a Smart Phone or tablet to view real-time announcements broadcasted in the arena on their phone/tablet. If you have the need for captioning services, please contact us at least one week prior to the event with your request. The service is intended for the hearing impaired community, but will be available to all guests. Visit the Brooklyn Marriott Guest Services on the Ticketmaster Main Concourse for more information. For all sporting events and most concerts, children up to 34” in height may enter Barclays Center free of charge, but must share a seat with an accompanying ticketed adult. Any child that does not meet this height requirement will require a ticket to enter the arena and must occupy their ticketed seat only. Please note that some shows (especially those intended for children) will have a different policy and may require all children to have a ticket. Barclays Center does not provide an area to check coats or personal belongings. Barclays Center is not responsible for any property that is lost, stolen, or damaged. Guests will not smoke in the venue. Barclays Center is a non-smoking venue and property. Guests who choose not to adhere to the above code of conduct will be subject to ejection without refund, and may also be in violation of city ordinances resulting in possible arrest and prosecution. Thank you for your cooperation! During an event, guests are recommended to express any compliments, comments, or concerns at our Brooklyn Marriott Guest Services Center, located on the Ticketmaster Main Concourse, or with any Guest Services employee. After an event, please email [email protected] to give feedback. Guests are also encouraged to use our In Stadium Solutions (ISS) system by texting "BC" with the Issue and Location to 69050. Barclays Center offers a wide variety of food and beverage items for our guests' enjoyment. We are proud to offer gluten-free and kosher options. No outside food or beverages will be allowed. Barclays Center Guest Services welcomes all feedback, questions, and concerns from our guests. To contact us via e-mail, contact [email protected]. Most e-mails will receive a return reply within 48 hours. Please visit our Getting Here page for assistance in traveling to the Barclays Center. Please visit our Disabled Services A-Z Guide for a complete list of services offered to guests with special needs. Door opening times for Barclays Center special events and concerts will vary according to each event. For New York Islanders and Brooklyn Nets games, doors will open 60 minutes prior to the scheduled start time, with occasional exceptions. For Brooklyn Nets games, the Calvin Klein VIP Entrance will open 90 minutes prior to the scheduled start time for courtside ticket holders and suite holders. All guests in attendance are required to wear a shirt and shoes at all times for their own safety. Barclays Center management reserves the right to deny entry to guests wearing clothing items displaying offensive text and/or images. There will be two zones designated for Drop Off / Pick Up located along Atlantic Avenue outside of the Calvin Klein VIP Entrance and IdentoGO Atlantic Avenue Entrance. There is one additional zone located along Flatbush outside of the Main Entrance. Guests on the Flatbush side are also welcome to use the designated Lyft Drop Off / Pick Up zone. Trained Guest Services and Security personnel will ensure the security and safety of all guests, performers, and employees at Barclays Center. In the case of an emergency, guests must comply with requests from venue staff regarding arena operations and emergency response procedures. For employment opportunities at Barclays Center with BSE Global, Brooklyn Nets Basketball, New York islanders, Levy Restaurants, or AEG, please visit our Careers Page. All guests entering the arena are subject to security screening, visual inspection, and bag inspection conducted by Barclays Center Security personnel. Security screenings are designed to detect prohibited items from entering the venue. Barclays Center has family restrooms available on all levels of the arena. Trained Emergency Medical Technicians (EMT) personnel are available to assist any guest in need at every Barclays Center event. The primary First Aid is located on the Ticketmaster Main Concourse near the Brooklyn Marriott Guest Services Center. A secondary location is on the Upper Pavilion near Section 212. In addition, Barclays Center is equipped with Automatic External Defibrillators (AED). Designated employees, including our EMT staff, have been properly trained and certified to use the AED. In the event of a medical emergency, contact a member of our Guest Services or Security staff for assistance. These devices are located at both of the First Aid locations. The distribution of promotional items, flyers, or printed materials is not permitted without written permission of Barclays Center and/or its tenants. The sampling and distribution of products is prohibited inside and outside of the building. Guests may not bring food and/or beverage items into the arena during events. Exceptions will be made for those with medical requirements and/or special needs. Guests with specific/special dietary needs due to medical conditions or special needs should contact Guest Services by calling 917-618-6111 or by emailing [email protected] prior to attending the event to arrange for reasonable accommodations. Glass bottles or metal canisters are strictly prohibited. Guests must dispose of the unauthorized items prior to entrance into the arena or return them to their vehicle. Brooklyn Marriott Guest Services Centers will not check-in or store any food or beverage items. We are now providing straws upon request at concession stands and respectfully ask that you only use a straw if it’s a personal necessity. We have transformed the lids of our cups so that you can consume your beverage without a straw. The best part, both the lid and cup are compostable. Join us in our efforts to protect the environment. The General Admission area, located on the floor of the arena, is standing room only and there are no seats. Guests with GA Floor tickets must enter at the IdentoGO Atlantic Avenue Entrance. Guests wishing to arrive early are encouraged to line up no earlier than 9:00AM. Doors will open at the same time for all guests. After entering the building, all guests with GA Floor tickets will receive a wristband to access the floor and will be instructed to select aisles which have access to the floor. We are proud to offer gluten-free food options at Barclays Center events. For more information please contact Levy Restaurants at 917-618-6300. Barclays Center is committed to sustaining LEED Silver Certification and being in alignment with the AEG 1EARTH program. AEG 1EARTH is AEG's environmental commitment. By acknowledging that we all share 1EARTH, we can understand how our operations affect the planet and how responsible decisions can improve the environment, our communities and our business. In addition, Barclays Center is committed to recycling in all areas of the arena. Recycling bins are located on both the Ticketmaster Main Concourse and The Brooklyn Hospital Center Upper Pavilion for guest use and in back of house areas for arena employees. For information regarding Group Sales Ticketing please call 877-77-BKTIX or email [email protected]. Barclays Center is committed to creating a safe, comfortable, and enjoyable entertainment experience. Please refer to our Code of Conduct. Brooklyn Marriott Guest Services Centers are located on the Ticketmaster Main Concourse across from Section 12/112 and on The Brooklyn Hospital Center Upper Pavilion behind Section 212. These centers are designed to provide information to guests with questions, concerns, or issues during Barclays Center events. In addition, Brooklyn Marriott Guest Services Centers provide assistance to guests with disabilities (see Disabled Services A-Z Guide). Guests may contact the nearest Usher or Security Officer if there is a spill or Housekeeping concern during an event. Barclays Center reserves the right to deny entry to visibly impaired guests. Any impaired guest causing a disturbance during an event will be asked to leave the facility and may be subject to arrest. Barclays Center has teamed with In Stadium Solutions (ISS) to provide guests with an in-game texting service, allowing guests to text issues to building management anonymously and discretely without having to leave the comfort of their seat. Guests may text the keyword "BC", the Issue and Location to 69050. To purchase tickets to an event from an international location, please visit ticketmaster.com. Tickets purchased internationally will be available for pick up on the day of the event at will call only. International tickets will not be mailed. Free Internet/Wi-Fi access is available to all guests at Barclays Center events. We are proud to offer Kosher food options at Barclays Center events at David's K Deli and Abigael's Brooklyn on the Suite Level. on the Ticketmaster Main Concourse. Kosher food options are also available on the Upper Pavilion for select events. Laptops or any type of personal computers or tablets will be admitted inside of the Barclays Center, however; guests are not permitted to use these items inside of the seating bowl to ensure that guests are not disturbed in surrounding areas. These items may be used in personal suites or around the concourse areas of the building. Barclays Center has an exclusive concessionaire agreement with Levy Restaurants. Levy Restaurants, founded in Chicago in 1978, is recognized as one of America’s fastest growing and most critically acclaimed restaurant companies, and is the leader in premium sports and entertainment dining. Levy was recently named one of the 10 most innovative companies in sports in the world by Fast Company magazine. The company’s diverse portfolio includes award-winning restaurants such as James Beard Award-winning Spiaggia in Chicago, Fulton’s Crab House, Portobello and Wolfgang Puck Grand Café at Walt Disney World Resort, renowned sports and entertainment venues like Churchill Downs in Louisville, STAPLES Center in Los Angeles, and American Airlines Arena in Miami, and events including the Super Bowl, World Series, U. S. Open, Kentucky Derby, NHL and NBA All-Star Games and the GRAMMY® Awards. Lost children/guests should be directed to any one of our Brooklyn Marriott Guest Services Centers, located on the Ticketmaster Main Concourse and the The Brooklyn Hospital Center Upper Pavilion. The employee will immediately notify a supervisor that they have received a report of a lost / missing child, (referred to as a Code Adam), and the Supervisor in turn, will immediately notify the Security Command Center and all other Departments. Parents looking for a lost child should contact the nearest Guest Services Staff Member or Security Officer. For safety reasons Barclays Center is unable to make in-arena announcements for lost children or guests. All lost and found items are taken to Brooklyn Marriott Guest Services Centers during events, located on the Ticketmaster Main Concourse and The Brooklyn Hospital Center Upper Pavilion. During an event, guests should visit a Brooklyn Marriott Guest Services Center to inquire about lost items. After an event, contact Lost and Found at 917.618.6185 or email [email protected] with a description of the item and the date the item was lost. Lost and Found is available from Monday - Friday, between the hours of 9 am to 5 pm. Barclays Center management assumes no responsibility for items lost at events. Located on the Main Concourse near the IdentoGO Atlantic Entrance, the Meditation Room at Barclays Center is an oasis of quiet reflection in the heart of Brooklyn. Conceived in partnership with the Downtown Brooklyn Neighborhood Alliance (DBNA), the room is available to ticketed event guests from Doors until End Time. The hours of operation are subject to change based on the event calendar. To request access during non-event times or for private use during event hours, please click here to make a request. All requests are subject to approval by Barclays Center & DBNA. For more information about the Meditation Room and the Downtown Brooklyn Neighborhood Alliance, please visit their web site at thedbna.org. Barclays Center does not process meet and greet requests. Please contact the individual team or artist through their website. Team Merchandise can be found in the Swag Shop located near the GEICO Atrium. Nets and Islanders Merchandise are also sold in front of the Dean Entrance, IdentoGO Atlantic Entrance, and on the East side of the The Brooklyn Hospital Center Upper Pavilion. To inquire about singing the National Anthem at any Barclays Center event, please email [email protected]. Your request will be forwarded to the appropriate persons. Parking at Barclays Center is very limited. We strongly recommend purchasing your Barclays Center parking in advance with our partner, ParkWhiz. There are phone charging stations located on the North and South side of the Ticketmaster Main Concourse and The Brooklyn Hospital Center Upper Pavilion Upper Pavilion for guests’ use. Sign up for Barclays Center "Behind the Scenes" newsletter and receive event updates, presale notices and more by visiting our Behind the Scenes page. The following is a partial list of prohibited items that are not permitted inside the venue. Barclays Center Management reserves the right to prohibit other items as deemed necessary. During hockey games at Barclays Center, protective netting is hung above the glass behind both goals. This precaution limits the amount of pucks that leave the ice at each end of the rink and enter the seating area. Although the netting adds an extra precaution, we remind all guests to stay alert at all times while the puck is in play. Barclays Center will be one of the most accessible sports and entertainment venues in the area. Centrally located at the intersection of Atlantic and Flatbush Avenues, it will be served by New York’s third-largest transportation hub. Visitors will have the option of taking nine different subway lines and the LIRR, just eight minutes from Wall Street, 18 minutes from Penn Station, and 20 minutes from Times Square or Grand Central Station. The Brooklyn and Manhattan Bridges also provide easy access from Manhattan, while the Holland Tunnel is a quick drive away. Trains: 2, 3, 4, 5, B, D, N, R, Q and LIRR. The 2, 3, 4, 5, B, Q stop at Atlantic Ave. The D, N, R stop at Atlantic Ave-Pacific St. The LIRR stop is at Atlantic Terminal located on Flatbush Ave and Atlantic Ave. Buses: The Flatbush/Atlantic Ave area is serviced by the B41and B45buses. To listen live to a sporting event while inside Barclays Center, guests may go to our internal radio channels 660 WFAN or 1280 WADO (Spanish). When there is a conflict with simultaneous game schedules, please check Bloomberg 1130 or The Apple 970 as alternatives. Barclays Center has a “No Re-Entry” policy for all events. Guests may not bring audio or video recording devices into the arena. These devices include, but are not limited to, video cameras/camcorders and audio recording devices. Any equipment not conforming to these rules must be removed from the premises or left at the Brooklyn Marriott Guest Services Center on the Ticketmaster Main Concourse during the event. For information regarding the purchase of season tickets, please visit brooklynnets.com or newyorkislanders.com. Seats at Barclays Center vary in size. Seats will be between approximately 17” to 22” in width. Barclays Center has implemented new policies to ensure a safe and enjoyable experience for all guests. To allow for speedier entry into the venue, we are strongly discouraging guests from bringing unnecessary bags. Patrons who do arrive with bags will be required to enter through the Dean St. Entrance. Those without bags will be permitted to enter through express lines in the main entrance. Patrons with bags larger than 18”x14”x6” should go to the Dean St. Entrance to get their bag screened and checked in. 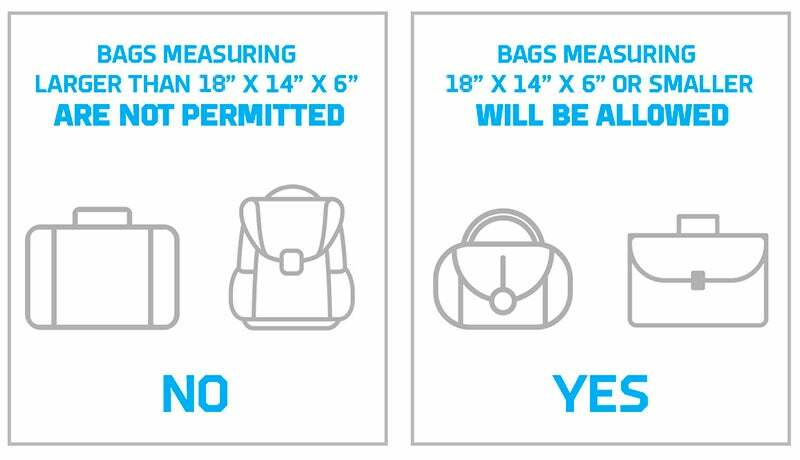 Patrons with backpacks and duffle bags smaller than 18”x14”x6” will need to go through a security screening at the Dean St. Entrance and will be permitted inside the venue with their bags. Please plan ahead and allow yourself enough time to pass through security. The If You See Something, Say Something™ campaign is a simple and effective program to engage the public and key frontline employees in identifying and reporting indicators of terrorism, crime and other threats to the proper transportation and law enforcement authorities. If you see something, say something! To report suspicious activity, see the nearest Usher/Ticket Taker or Security Officer, or call 1-877-A-THREAT (1-877-284-7328). Barclays Center is pleased to offer sign language interpretation during concerts/special events for guests with hearing impairments. Requests for this service must be received at least 3 weeks after the on sale date. Please email [email protected] for more information. Items may not contain any website or advertising materials. Smoking is not permitted in the arena at any time. The immediate area around the arena is also a non-smoking campus. Additionally, electronic smoking devices are not permitted to be used inside the building. There is no re-entry. Guests are encouraged not to bring strollers to the arena. Strollers are not permitted in the seating sections of the arena due to potential safety hazards. However, strollers may be checked into our Main Brooklyn Marriott Guest Services Center, located on the Ticketmaster Main Concourse. Strollers are allowed in suites. Barclays Center offers over 100 suites with size and price points to fit all needs. Your Barclays Center suite also includes: VIP services and amenities, access to the private clubs and restaurants, and access to the premium suite level concourse. In compliance with the Americans with Disabilities Act, all Suites are wheelchair accessible. Guests needing to call a taxi may go to any one of our Brooklyn Marriott Guest Services Centers for assistance. The designated taxi stand is located across the street from the arena along Atlantic Avenue. The Nets and Islanders offers the largest selection of officially licensed merchandise featuring Brooklyn Nets and New York Islanders gear. The Team Store hours of operation are Monday-Thursday 10am-7pm. Friday-Sunday 10am-8pm. Hours may vary on event days. Please contact our Box Office at 917-618-6700 for information regarding ticket pricing and availability. To expedite your entrance into Barclays Center, please save your tickets to your Apple or Google wallet prior to arrival. For arena events that have PDF tickets, you should print your tickets prior to arriving as well. Barclays Center is equipped to scan Mobile Tickets with QR codes on electronic devices, but CANNOT scan PDF tickets on electronic devices; all PDF tickets must be presented in a hard, paper form to gain entry to the Center. Ticketmaster account holders ONLY who were are unable to print tickets prior to entering the event can visit the American Express Box Office for further assistance. Barclays Center’s American Express Box Office will not print tickets for guests who purchased through a third party ticketing vendor. Please note: Tickets are not available at the box office on the first day of the public on sale. Tickets will generally become available to purchase at the Box Office 24 hours after the online release or next business day. To avoid problems with counterfeit, stolen or voided tickets, guests should make their purchases through authorized outlets only (Ticketmaster). Barclays Center will not be responsible for validating tickets that were not purchased through an authorized outlet. Water/drinking fountains are located on all levels throughout Barclays Center. Our Brooklyn Marriott Guest Services Center provides complimentary wheelchair escorts to guests when requested. Escorts are available at any entrance when doors open for all guests. Will Call will be available at the Ticketmaster kiosks located in the Geico Atrium and Dean Entrance. Will Call is also available for pick up at the American Express Box Office located in the Geico Atrium. American Express Box Office will not accept third party Will Call. Please note the box office closes approximately 1 hour before the estimated end time of the event and will not be available to handle will call or ticketing issues.